Northern Ireland-based Eglinton (Timber Products) has taken delivery of four new Volvo FH500 tractor units, including a Volvo FH 25-Year Special Edition. The new trucks were purchased from Volvo dealer, Dennison Commercials Ltd, who Eglinton have been doing business with for 30 years. Northern Ireland-based Eglinton (Timber Products) has taken delivery of four new Volvo FH-500 tractor units - including a Volvo FH 25-Year Special Edition – from Dennison Commercials. The latest arrivals make a 21 vehicle, Volvo presence in the company’s 25-strong fleet of trucks located in Eglinton near Londonderry/Derry. Designed for efficiency and driver comfort, the new trucks come with Volvo’s award-winning I-Shift automated gearboxes and steel bumpers and inside the Globetrotter XL cabs, the spec’ includes double bunks, leather seats and a fridge. Eglinton’s Volvo FH 25-Year Special Edition comes in Crimson Pearl Red, the red colour paying tribute to the original vehicle, which was launched in 1993. 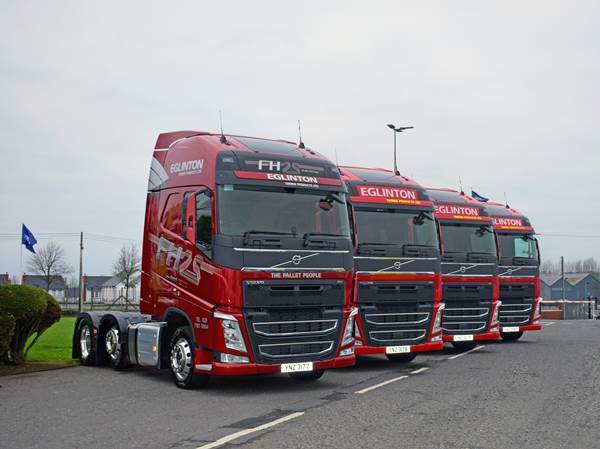 Eglinton’s additional three come in Volvo Agra Red designed with Eglinton’s eye-catching livery. Alcoa Dura-Bright alloy wheels provide the perfect finishing touch for the smartly presented group.